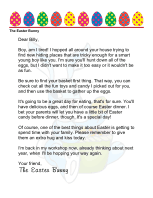 This printable letter from the Easter Bunny wishes a Happy Easter to a good girl. Happy Easter! I had a lot of fun hiding your eggs this year. I found some great hiding places, but not anywhere too crazy because I don't want you to mess up that beautiful Easter outfit you have. I also hid some delicious candy. You like chocolate, right? 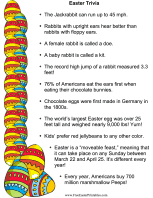 Don't eat too much at once or you'll get a tummy ache and won't have room for Easter dinner. Also, enjoy this day with your family. Easter is such a special time. I hope you enjoy your Easter basket. I put some special little toys in there for you, including something cuddly. It's so fun to find just the right gifts for good little girls. 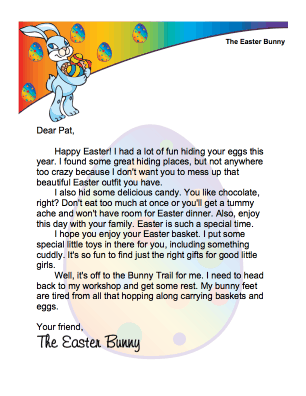 Well, it's off to the Bunny Trail for me. I need to head back to my workshop and get some rest. My bunny feet are tired from all that hopping along carrying baskets and eggs.